Being in the presence of very powerful Entities will always have an effect on the physical body in one way or another, it does not matter if it is Angel or Daimon. In this writing I wish to share with you some of my own experiences, when being in the presence of these mighty spiritual beings. Some people in the fields of the esoteric, magickal community will say that these Entities are part of the mind or subconscious. From my own personal experience, and I realize everyone`s experience is different, they are beings separate from us and independent. With sometimes their own agendas, however they can influence the mind in a big way if they so wish to do so. I remember about three years ago, I found myself in the presence of two Angels that had manifested in a room in my house. They where very tall beings and a little intimidating, only due to their size and build, which was very solid. They had what looked like some kind of armor on and one of them had a sword in their hands. They both had very red fiery eyes, is the best I can describe it and nether of them had wings, which is common in many artists pictures of Angels. These Angels where very serious Angels with serious expressions on their faces, as most Angels are that I have come in contact with. I remember starting to get a serious headache and also a blood nose while in their presence, they spoke to me through my mind using telepathy. They told me that they would not come any closer to me, due to the effect it would have on my body. The results of this was already taking an effect just being in the same room as them. After the Angels left, my headache started to subside, however my nose bleed continued on and off through out the rest of the day. These Angels where not intending to do me any harm, it was just my bodies reaction to their strong energies, having been directly in their presence. There have been many other times in my life that these experiences and many other different ones have taken place. However, now I will jump to some more recent experiences in which my body has taken a toll due to the physical manifestation of the Entities. 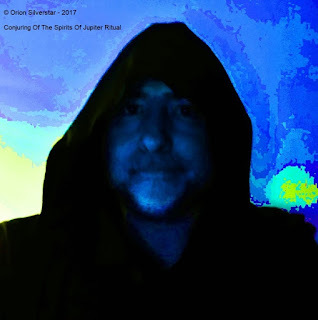 The reason I share these experiences is because the spirits working with me have asked me to do it as others may also have gone through experiences like this or something very similar. Sometimes when I hear people in the "New Age" talk about working with Angels I have to wonder. Not that I am judging someone else`s experience, don`t get me wrong. But I wonder if what they are witnessing is a thought form they have created, of what they believe the Angel to look like in their mind. Thought forms can still be very powerful and in fact I often use created thought forms myself to do different tasks. The reason I say this is because every experience I have had with these spiritual beings have been very intense. Even just a week ago, I was performing an initiation ceremony in my home to become initiated into the current and tradition of Masseen Wytchcrafte. This ceremony involved more than one invocation of different spiritual beings relating to that spiritual current, I had to call on them by name. Though the ceremony did not call for this, I decided to make sigils for each of these spiritual beings. As this ceremony was all about initiation, there was a part in which I was to be put under a test by these Entities in which I had hopefully invoked. The whole initiation ceremony was a success. When I reached the part of the ceremony where I was to be tested, suddenly a black figure moved through the wall in my room. It was one of the blackest figures I have ever seen before, only the outside shape of the figure could be seen as everything inside of this shape was just blackness. It moved so fast and seemed like it was wearing a hooded cape of some kind, much like my own hooded cape. Then one of my main red pillar candles went out and that seemed to be it, no knocks on walls, no scratching sounds, voices or changes in temperatures or smells, things like this. So after a little bit more time of completing the ceremony and meditation, I closed down the ritual in the usual way. I thought the test was over and that was all there was to the initiation, I was wrong. Over the next few days, I experienced a deep sense of dread and depression that was lifted not long after this. I know this was also part of the initiation as after this I was told by some spirits around me that this was the case. Not only this but I did a Tarot reading for myself which brought up the Tower card along with other cards also relating to this. Also, not only this but the Tower card has a connection with the zodiac sign of Scorpio, which is my own sign. I have now learnt that if someone has things deep down inside their subconscious that they do not wish to deal with. Well it will come up to the surface, as these spiritual beings will show you these things so that you can deal with it. Sometimes it can be very nasty, but it is all part of the process of initiation. They are not trying to punish you, but to make you stronger when you end up getting through it, and this could take sometime. They will not put you through something you are unable to work through or find a way through, even though it may seem that there is no way through it. They may push you to the point or edge, but they are your best teachers, no matter how brutal it may seem at the time. As part of this initiation ceremony, I had to go through it unprotected, trusting solely on the spiritual beings of the spiritual current I was getting initiated into. I hope those who read this blog find it interesting and maybe able to relate to it themselves in some way. Please feel free to leave me any questions in relation to this writing and I will answer it the best I can.